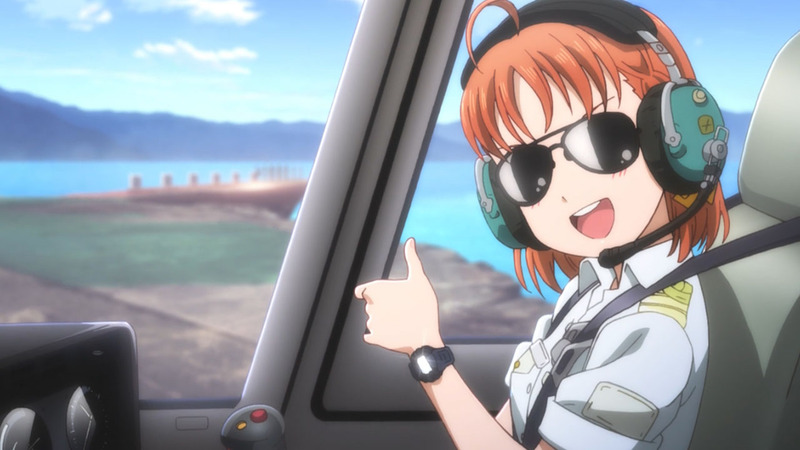 In the world of idol pop anime, the success of Love Live! has managed to grasp the imagination of viewers through a simple, yet effective tale of friendship, optimism and reaching for your dreams. If you’re unfamiliar with the ‘idol pop’ tag, it’s a genre of popular music that’s found its heart in Japan. Often put together by talent agencies, most idol groups feature young women keen to develop their performance and singing skills. Meanwhile, a devoted fanbase fill concert venues swirling their glow sticks (often in the colour of their favourite member) while urging the group to do their best. Groups such as AKB48, Momoiro Clover Z and Babymetal perhaps show the dizzying heights that some idol outfits can aspire to. Naturally, it’s also a genre of music that’s been ripe for anime titles. From the 1980s fore-runner to reality TV, Lemon Angel, through the robot singer Key the Metal Idol, who wanted to crowd-source enough love from her fans to become human, idol singers have been a recurring sight in modern anime. The likes of Wake Up, Girls! and THE iDOLM@STER have been winning franchises with singing stars, but it’s Love Live! that’s really managed to establish itself as the winner of this particular anime niche. Originally conceived as a joint project between Dengeki G’s Magazine, music label Lantis and animation studio Sunshine, Love Live! first appeared as a manga series in Dengeki G before making the leap to anime under the care of Sunshine in 2013. The appeal of school idol group μ’s (pronounced ‘Muse’ – no relation to the popular UK rock outfit!) struck a chord with anime fans keen to enjoy some musical elements in the mix. Love Live! was also the series that managed to launch a thousand cosplays. Love Live! Sunshine essentially wipes the slate clean and presents a new location and a whole new cast. Like its predecessor, the plot again revolves around a group of girls faced with saving their school (in this case Uranohoshi Girls’ Academy) from being closed. But relocating the story to the picturesque seaside town of Uchiura gives the series a more rural appeal. 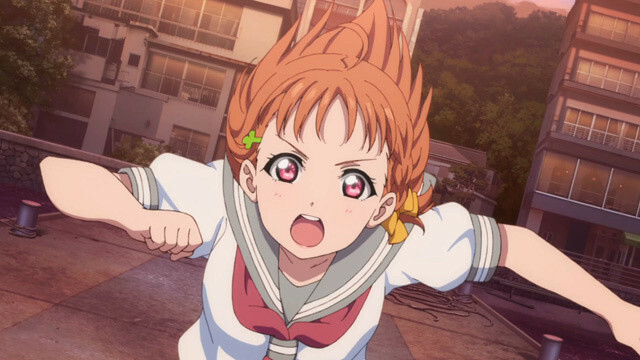 Chika Tatami (voiced by Anju Inami) is the main protagonist, possessed with an irrepressible spirt and optimism that provides the engine for the school idol group. The formation of Aqours (pronounced ‘aqua’ – yes, why spell anything right?) takes time to get up to speed with its full complement of 9 members, but much of the appeal of the series is the process by which the group gradually recruits its various members. As a result, Aqours itself features a diverse ensemble, many drawn from traditional anime character stock. Dia, for instance, is a classic tsundere figure. Initially dismissive of Chika’s efforts, Dia (in her role as student council president) appears to be desperate to shut down the idol group before it even gets off the ground. Dia also employs an hilarious catchphrase of “bu-bu desu wa!” – or basically doing an impersonation of a quiz show buzzer when she feels the need to correct other students. Meanwhile, the dark-haired Yoshiko takes on the role of the token crazy character (and also least likely contender for being an idol group member). Obsessed with the occult, Yoshiko continually does theatrical turns in her bid to be seen as a ‘fallen angel’ and insists on being called “Yohane!” as a result – providing some of the comedy moments of the series. She’s equalled by the antics of Mari, a third-year student who is appointed director of the school (don’t ask) and whose tortured use of English phrases come across as irritating or charming depending on your anime tastes. The pragmatic Kanan emerges as one of the most sensible members of Aqours, while Riko (a successful pianist) is a natural fit for the musical muscle behind Aqours’ tunes. This is despite Riko’s odd fear of dogs, which presents its own challenges over the course of the series. Kanan, Dia and Mari are third-year students, so they carry a certain seniority among the other Aqours members. In fact, there’s a secret history of sorts shared by the trio which provides one of the essential subplots of the series. Naturally, as a music-themed series, it’s also the tunes that help define the show. Luckily, Love Live! Sunshine has plenty of bangers in the mix. 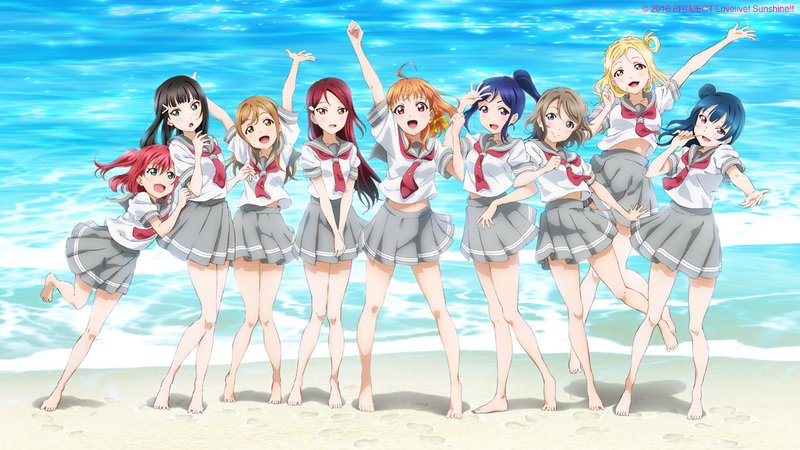 ‘Yume Kataru yori Yume Utaō’, which forms the ending theme for season one, acts as something of a theme song for inspiration with its strident energy and showcasing of Aqours’ vocal talents. Elsewhere, the punchy melodies of ‘Mirai no Bokura wa Shitteru Yo’, which acts as the opening theme to season two, is a busy layered composition packed with idol pop goodness. Love Live! Sunshine, as with its predecessor, utilises a mix of traditional anime techniques along with CGI elements for the musical numbers. The use of CGI in anime is, as ever, an ongoing debate. Arguably, however, it would be tough to produce a 9-unit choreographed set piece with sweeping camera angles using traditional animation techniques. On the whole, the series successfully pulls this combination off and demonstrates how far CGI techniques have evolved. As an anime, the series is also very efficient in terms of delivering its story without spending whole episodes wandering off the point (something many popular anime titles could learn from). The character design is simple, yet effective with a nice line in striking outfits for the performance scenes. But perhaps the core concept of the series is that of Aqours working together as a team to reach their goals. Although the idol group face some tough obstacles on their journey, it’s the idea that they’re greater than the sum total of their members that carries the day. As a result, Love Live! Sunshine emerges as a testament to not only cherishing a dream – but also achieving it. Paul Browne is the founder of the website J-pop Go. Love Live! Sunshine!! is released in the UK on Blu-ray and DVD by Anime Ltd.
Sunrise have a nice little earner with Love Love!. 2) They have additional revenue from music sales(Show is full of good songs). 3) Figure and other merch deals. 4) Movie releases & retail release of said movies were insanely high in sales. I’m pretty sure although Sunshine wasn’t quite as huge(But still one of the top 3 shows in Japan that year). They’re still making insane amounts of money from the franchise. It’ll be interesting to see what they do next after Sunshine, because its a license to print money. Now please give us Season 2 on BD! Thanks :).